This is based on Robert D. Richardson, First We Read, Then We Write. Emerson on the Creative Process (Iowa City: University of Iowa Press, 2009) pp. 8f. I have not verified whether Coleridge said this. Even if he did not say it, it's interesting. 1. This post is related to the previous one. "Incremental reading," even if taken in the most modest sense, does not, per se, differentiate between these four different kinds of reading. There is no criterion that would would allow the student to distinguish between what seems important and what is important. In fact, it favors what seems important. 2. Added Saturday, August 07, 2010: I have found the quote in Emerson's Journals at least: "House of Seem & house of Be. Coleridge's four classes of Readers. 1. the Hour glass sort, all in all out; 2. the Sponge sort, giving it all out a little dirtier than it took in; 3. of the Jelly bag, keeping nothing but the refuse; 4. of the Golconda, sieves picking up the diamonds only." (Joel Porte, ed., Emerson in His Journals (Cambridge, MA: The Belknap Press of Harvard University, 1982), p. 130. "Incremental reading is a learning technique that makes it possible to read thousands of articles at the same time without getting lost. Incremental reading begins with importing articles from electronic sources, e.g. the Internet. The student then extracts the most important fragments of individual articles for further review. Extracted fragments are then converted into questions and answers. These in turn become subject to systematic review and repetition that maximizes the long-term recall of the processed texts. The review process is handled by the proven repetition spacing algorithm known as the SuperMemo method. The basic idea is that you "break down" a larger document into smaller chunks in order to learn them by heart. Nothing wrong with that, but this method will not allow you to read thousands of articles at the same time. Nor will it necessarily lead you to understand the big picture. Oh ... and they forgot to tell you another important thing: It cures cancer, too! The influential and classic paper Word Processors: Stupid and Inefficient by Allin Cottrell. written in 1999. is still worth reading, even if you end up disagreeing with most of the conclusions. Cottrell argues: "The word processor is a stupid and grossly inefficient tool for preparing text for communication with others." The main argument is that a word processor mixes up or conflates two tasks that are conceptually distinct, namely typesetting (or worrying about how the end product, the printed text. should look) and the "composition of the text itself." By this, he means "the actual choice of words to express one's ideas, and the logical structuring of the text." In writing we should concentrate on the second task. Worrying about the looks and WYSIWYG gets in the way of thinking about the substance. In this context, a text editor is better than a word processor. It does not distract you by confusing formatting and logical structure. A text editor does not save your work in a proprietary format. It uses plain text that can be used in any application. Cottrell's "strategy," for a strategic decision it is, advocates for the second step, called "type setting" by him, another program that specifies "the structural status of bits of text." He advocates LaTex, but any markup language, including any wiki dialect, will do. Nor am I sure that a "conceptual distinction" of the sort noted by Cottrell should carry as much weight as he thinks. As technology has advanced, many tasks that were once conceptually distinct have been unified or compressed into one new task. Still, I think reflecting on what one is actually doing is always a good idea. This is why I consider this short essay important, even though I am not likely to take up LaTex at this point. 1. "One very attractive feature of LaTeX is the ability to change the typeset appearance of your text drastically and consistently with just a few commands." My first computer was a Commodore 64; must have been around 1984. The Commodore 64 used a TV screen as a monitor. I even acquired a storage device: a tape recorder. The word processor was on a cartridge, called "Quick Brown Fox." I remember how tedious it was, having to switch between the editing and the view mode. Loading a file took an eternity. I used the thing mainly for playing around, but I got at least one paper written with it. When I printed it out, I first decided to print in tiny print as a backup. The program crashed and the file got corrupted so that I never was able to print it out again. My presentation of the paper at a conference was severely hampered by the fact that I could hardly read it. 1. It used 8k ROM, had forty columns, and was a pain (though given the constraints under which it had to run, made it almost a miracle that it did word processing at all). I tried to find out something more about this word processor on the Internet. All I encountered was collectors who tried to encounter this "very rare" cartridge. It always amazes me what kinds of things find worthy of collecting. Notes now has the option to turn off the toolbar with the distracting icons. Synchronisation with Simplenote has also been improved. I am using, at least for now, ResophNotes, which has a much better search feature and is now at version 1.03. See Notational Velocity for Windows? Here is a paper on Darwin's method, arguing that it was neither purely inductive nor deductive. Darwin worked on "hunches," or, as I would say, "informed hypotheses" based on previous research. His Notebooks, about which I have written before, show this. The paper runs "into open doors," as it were, or argues for the obvious. It is also philosophically primitive. Of course, induction in a simple-minded Baconian sense does not work. Karl Popper argued quite a while ago about the non-existent method of "collecting facts and then 'drawing conclusions.'" Rather, he said, we formulate bold or not so bold theories as answers to questions that we can then test. One has to understand the "problem situation" (Collingwood) in which an author found herself or himself. The notebooks are interesting, among other things, because they allow us to understand what Darwin at various stages thought was the problem to be solved. 1. See here, here, and here. Traveling with a Desktop Typewriter? "This is what it is to be an intellectual"—really? Derrida's behavior is more than just a bit strange and has little to do with intelligence. What about writing by hand or with another type writer? And what about a portable typewriter? They did make them, you know! But I guess a prtable typewriter would not have been up to Derrida's forceful writing. Tn any case, his obsession was today's equivalent of carrying a desktop computer, large keyboard, monitor, and all the cables with you rather than a note- or netbook or iTouch. It's outright weird. Like Heidegger, she thought writing by hand possessed a "particular closeness." She is also supposed to have said: "The word processor is... a glass square which separates one from one's thoughts and gives them a premature air of completeness." All I can say is: This is not my experience, but then I have never experienced this kind of "completeness" even after my stuff is published. I am never satisfied, and have good reasons never to be satisfied (as Iris Murdoch could be). It's a moral failing! PPC iNote 2010 is a personal or desktop wiki application. It seems capable. I have not tested it, and given the screenshots, etc. I will not test it either. Home edition: $29.00 (though downloadable for free) is for personal, non-commercial use only, offers max. 500 notes, limited support and upgrades - 30 days. Standard edition: $ 79.00 is aimed at professional users and offers more notes and extended support and upgrades, offers max. 1000 notes, 3 months. Professional edition: $249,00 is aimed at professional users and offers nearly unlimited notes and full support and free upgrades for a year. "Unlimited" notes seems to mean 100.000 notes. $249.00 for just one year? I wonder who would buy this. $79.00 for three months and just 1000 notes? You would have to be stupid. The pricing and the very serious limitations in time and capacity disqualify iNotes 2010 as a serious offering—at least for me. This is the main reason why I will not even try it. Here is Scriver, Scrivening, Scriverastic. This paper goes over the same ground that some of my blog entries go. A little too Wittgensteinian for my tastes, but very interesting nevertheless (at least to me). No further comments (at this time)! Here is a paper about Automate, a proposal for a system that would "allow end-users to utilize web-based data sources to create reactive automation. The system comprises a uniform internal data model, and a constrained-natural-language interface to create rules. Through initial evaluation we have demonstrated that the majority of participants found it easy to create rules, and thought Atomate would provide value in a number of personal information related settings." It is related to the Haystack project, about which I wrote earlier. WriteFlow is a word processor based on a database. It's only for the Mac, and it's in Beta. I cannot try it out because I don't have a Mac, and I will not buy one just for this program. But the idea is intriguing: "There are key advantages in using a database over a simple file based editor, as Microsoft Word or literally every other word processor out there are. Just to single out a few, we’d like to name metadata, identity and searchability as such advantages. We met people who used local installations of WordPress just to be able to use those features of a database." On the other hand, as they also point out: while writing in a database may seem like an odd thing to do ... it is something that is happening every day and all the time, because every blog, every content management system of any website, every forum on the web is nothing else." In fact, it's what I already do regularly because ConnectedText is also based on a database. It appears that the difference between WriteFlow and a typical Wiki will be that it has WYSIWYG formatting. It also has footnotes and quotes management, though bibliographies are a bit more work and have to be done manually. They say that "WriteFlocw would rock your world." I guess it wouldn't rock mine. Still, it's an interesting way to think about the future of word processing and one might wonder why this approach has not caught the attention of major players in that areas. It would represent a real step forward and give users some real benefits—not like absolutely useless "ribbon." 1. There is a video describing the bibliographical and footnote here. It might have been good, if it also contained information on the more mundane word processing functions. Do a search on "Personal Wiki" with the option "Last 24 Hours." One of the applications that shows up in the advertisement sidebar is "Organise your Notes" by "www.bauerapps.com/RightNote.html". Now the Application "RightNote" seems to be nothing but a Keynote clone with slight improvements. Keynote was freeware, RightNote is not. Furthermore, RightNote has no wiki capabilities at all, and it chokes at around 8000 entries (perhaps earlier). My question is: Who is to blame for this false advertisement? BauerApps or Google or both? 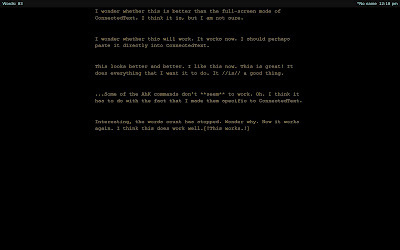 ConnectedText has a full-screen mode. I don't use it as often as I might because it has no way to restrict the margins. So lines extend from one side of the screen to the other. That makes it difficult to take in a line at a time on my widescreen monitor. Q10, which I took a closer look at today, seems to work better in this regard. You have to click on this picture to see any of the details. Works flawlessly and almost seamlessly. For those who use Emacs, a minor mode I heard about first today: Freex. It's been around since 2007. I tried Emacs for a while, but it did not "click" with me.